Whenever we’re travelling in Asia I enjoy the availability of matcha in all its forms. There a variety of matcha sweets, like matcha ice cream and cake, matcha mochis or matcha kit kat. All of them are delicious and all of them are green. But what I love most is the availability of matcha latte in almost every coffee shop. I love coffee as much as the next person but a warm cup of matcha latte feels like having a cup of coffees elegant cousin. And it contains caffeine too, so there’s no need to worry there. Matcha is a special ingredient that was not well known only a few years ago in Europe but this is quickly changing. 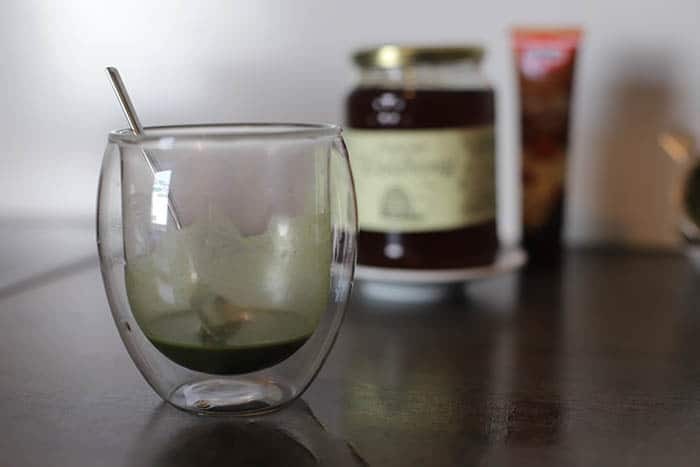 I’m pleasantly surprised that in the last few years a number of restaurants, coffee shops and bakeries in Austria are offering matcha next to their traditional coffee variety. The best reason, of course, it’s the taste. It’s just super delicious. Matcha is very versatile as you can serve matcha latte either hot or cold. You can crown it with milk foam or alternatively top it with some whipped cream. 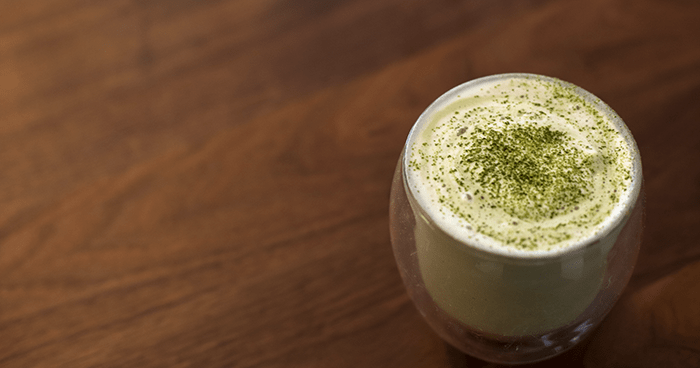 This recipe features my favourite kind of matcha latte and is served warm, with soy milk and milk foam on top. 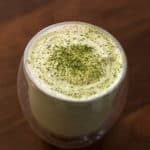 Cold matcha latte works well with some ice cubes or vanilla ice cream. I love the nutty taste of soy milk for matcha but really any kind of milk works. You can use your regular cow milk, skim-milk or lactose-free. 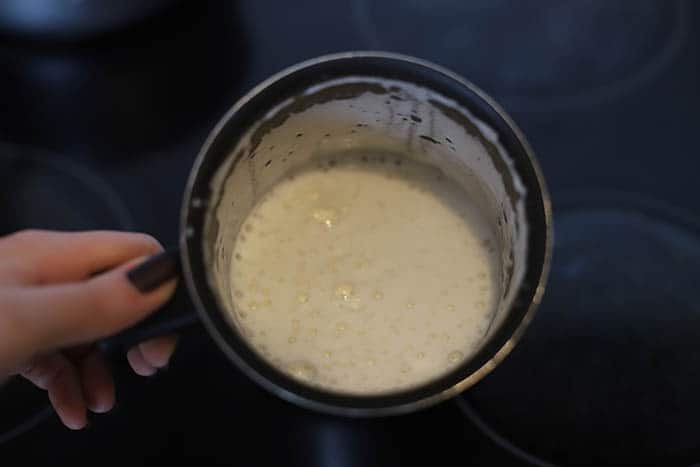 I’ve also tried this recipe with cashew milk and almond milk and the results were delicious. 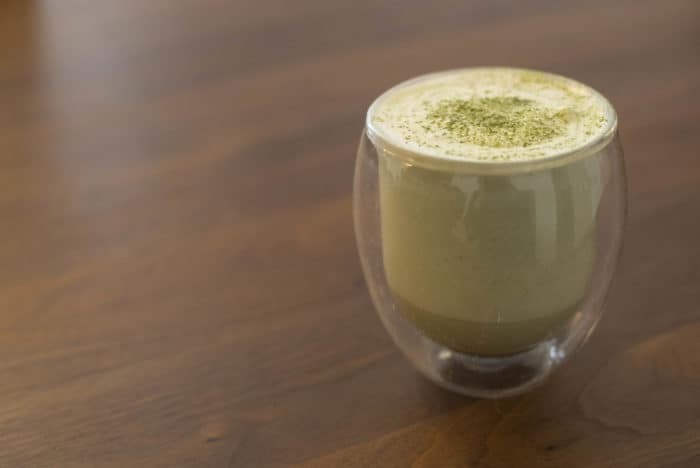 This recipe for matcha latte is made with soy milk, but really any kind of milk works. This recipe is for medium sized cups serving two people. Vanilla and honey are optional. 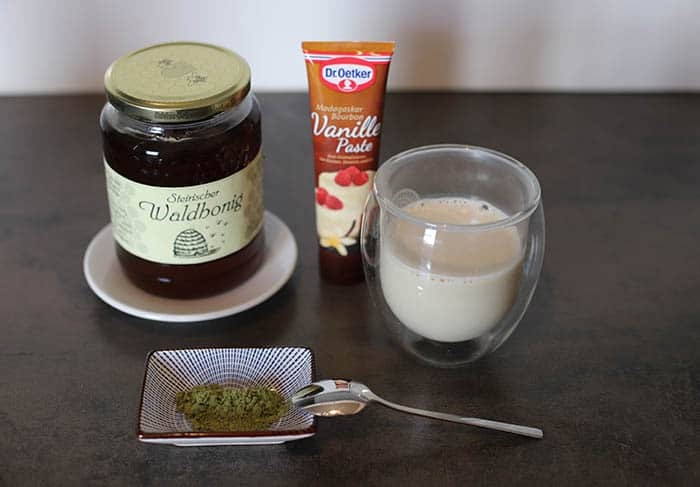 I recommend to use some kind of sweetener as matcha by itself is quite bitter. 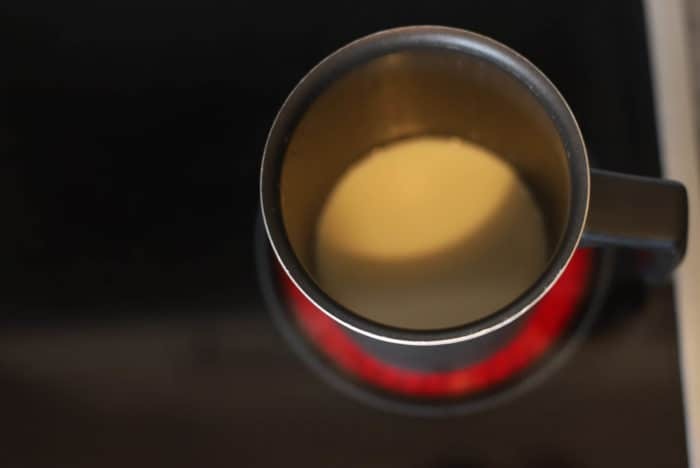 Heat the milk in a pan until it's hot but still drinkable, don't bring it to boil. Add vanilla here, if using. While the milk is warming up stir the matcha into the hot water. Use a small spoon or any other tool and keep stirring until the matcha is completely resolved. This can take a few minutes. You can use a small sieve to dissolve it more easily. Add the honey and dissolve it in the matcha mixture. Optional: you can use a frother to create some cappuccino-style milk foam. If you don't have a frother think about investing in one. It's not expensive and it's great not only for matcha but for coffee as well. Pour the hot milk over the dissolved matcha into the mug. Stir some more until milk and matcha are well combined. For looks you can sprinkle it with some extra matcha powder. Get the right matcha for this drink. You don't need to buy the very expensive stuff because it's mixed with milk and sweetener anyway. In my opinion a good cooking matcha is the best balance between taste and reasonable price for a delicious matcha latte. Good matcha has a nice, bright green colour, it should never look grey, brown or pale. My prefered matcha choice was always japanese and organic. Soy milk is nice with this drink, but as mentioned before any kind of milk will do. You can use your regular cow milk, skim-milk, low-fat milk, lactose-free milk, cashew milk... you name it. I haven't tried it with every milk there is, but every milk I tried worked out nicely. The milk foam may not work with some milk types though. For a 100% vegan version don't use honey like I did in the pictures. You can go for brown sugar or syrup instead.